This paper analyzes equity in health care utilization and out-of-pocket expenditure on health care in India using two rounds (52th round 1995-1996 and 60th round 2004-2005) of National Sample Survey data and data from a household survey carried out in 2007. The findings indicate that the average hospitalization rate has increased and the corresponding value of the concentration index has decreased over the last ten years. However, the health care payment structure is seen to be regressive for inpatient care, and more so for outpatient care. The main reason is the very high out-of-pocket payment on medicine and diagnostic tests even in government hospitals. High out-of-pocket payment has resulted in 34 percent poor households losing all their past savings, 30 percent of households borrowing with interest and 2 percent of households selling their assets. These findings indicate the urgent need for putting in place risk pooling mechanisms. India’s economy has experienced spectacular economic growth in recent years. The average economic growth (in real terms) over past 20 years is around 5 percent of GDP. The country has achieved a significant progress in numerous economic fronts: the economy has quickly recovered from global economic down turn, reduced poverty, increased demand due to rise in income, increased physical accessibility due to higher investment on infrastructure. However these achievements raise a question—what are the consequence of this advancement when we come to health? Recent experience shows that in terms of health indicators India’s position is very close to the bottom in a ranking of all countries outside Africa . In terms of per capita income India is a better position than Nepal and Bangladesh but in case of mortality rate former two countries have better place compare to India. In view of the above background this study raises few pertinent questions: Can we have “inclusive growth” unless health care is brought social welfare? Empirical studies show that though less affluent households in India have a higher burden of diseases, spend a higher proportion of their family income for health care than their richer counterparts [1-4], they receive lower share of public subsidies on health care [5-8]. Around 80 percent of the expenses for health care is covered by own out-of-pocket which is often posing an enormous burden on underprivileged households [9-11]. Sometimes the expenses on health care are so high that households are unable to recover them from current income flow, leading to depletion of assets and a permanent fall in income flow. This causes the household to slip deeper into poverty . However, the option of financial protection mechanism to mitigate such burden is very limited [13- 17]. As a result, protecting households from high health care expenditure continues to remain as a formidable challenge, particularly for countries with high levels of poverty. 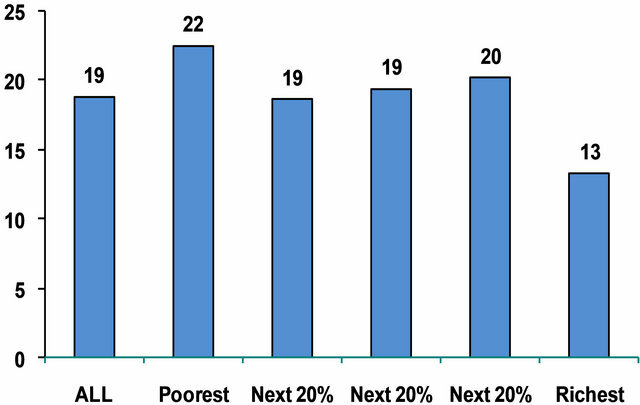 This clearly indicates two fundamental problems of the Indian health care system: 1) poor people are not adequately benefiting from the public health care services (implying that the government subsidy does not always reach the poorest of the poor); and 2) the poor people remains significantly unprotected against unanticipated shocks caused by the need to seek health care. Recent government policies relating to health and population, implicitly acknowledges the need to address the question of health financing and its equities and vulnerabilities in a more systematic way. First, the government has increased health expenditure from 0.9 to 1.4 percent of GDP and set a target to increase 2.5 percent by 2017. Secondly, many state governments have developed comprehensive health sector strategies, with support from donor agencies, with the objective of improving health outcomes in the state, especially targeting the economically vulnerable sections. However, the most important question is: Will the higher allocation in public health expenditure ensure better health for the poor and reduce the risk of high health care expenditure? This paper argues that whether the answer to this question will be in the affirmative is doubtful given the current inequities in the health care system in India. In this background, the present paper attempts to answer a few pertinent questions on equity in health care access and equity in out-of-pocket payment with special reference to West Bengal: Can we have “economic growth” unless health care is brought under social protection? Do the poor people really benefit from present structure of the health care system? Does public expenditure in health and health care produce equitable result in the health care market? Keeping the afore said research questions in mind the objective of the study is to assess the health care services in terms of equity. Equity relates to the principles of social justice, fairness and absence of disparity. Despite consensus about the importance of equity in health care, there is an open debate on what health equity means and what the targets are that should be aimed at. Researchers have identified three principles of equity in health and health care— equal access to health care for those in equal needs; equal utilization of health care for those in equal need; and equal (or, rather, equitable) health outcomes. Given that access to health care is hard to measure, researchers generally focus on equal utilization of health care services and equitable health outcomes as observable proxies. In addition, researchers have also examined equity in financing of health care. A common strand in works on equity [18,19] is its focus on needs. For instance, some works define equity in health and health care in terms of needs of the target population (corresponding to vertical equity1); others focus on equality of access or utilization for people with equal need (corresponding to horizontal equity2); while equality of marginal “met” need is emphasized by others. This raises the question, how to measure “need”? Given the peculiarities of the medical care sector  a customary practice in empirical research has been to measure “need” in terms of self-reported morbidity. Thus the equity is assessed in terms of self-reported morbidity and consequent health seeking behavior. This approach implicitly assumes that the respondent is always able to perceive the onset of morbidity and seek treatment when required. This approach, however, has one limitation. According to this approach need depends on self perception of the patients (or his/her demand for health care services) - whether they actually seek treatment or not. Sen (2006), however, warns that social influences may reduce expectations and keep a person content in situations that appear unsatisfactory to others: “… the malleability of mental attitudes… may tend to hide and muffle the extent of deprivation in many cases,” . In this context, Sen (1985, 1993) cites a study by Lall & Seal (1949) during the Great Bengali famine of the 1940s reporting that 48.5 percent of widowers felt themselves to possess poor health status, as compared with 2.5 percent of widows [22-24]. Sen (1993) also refers to the poorer selfreported health conditions reported in Kerala (having developed health and education) compared with states like Bihar and Uttar Pradesh with poor health infrastructure . So, in the health care market, the perception of need or the demand for seeking treatment will depend on many factors like caste, religion, culture, economic status, gender, supply side environment of the health care etc. and it is systematically different from that for others goods or services. Moreover, the health care market is characterized by principal-agent relationship; the asymmetry in information between the patient (principal) and physician (agent) may allow the latter to prescribe unnecessary diagnostic tests and treatment . However, there is a large volume of literature suggesting that self-reported health is an acceptable indicator of general health with good construct validity [25-28], and a powerful predictor of mortality risks , disability  and morbidity [31,32]. A medical study in Bangladesh has also found strong correspondence between self-reported health and actual physical measures of health . This study primarily based on the unit level data from the two national-level surveys conducted by National Sample Survey Organization on Morbidity, Health Care and the Condition of the Aged (in January-June, 2004 and in 1995-1996). The survey gives the amount of health care expenditure that is financed from each of income, savings, borrowing, sale of assets and other sources. The source of finance is reported for payments made for both inpatient and outpatient care. We multiply the monthly per capita consumption expenditure by 12 to make it comparable with inpatient costs that are recorded for a one year reference period. The household is the unit of analysis. Expenditure on inpatient care includes all direct and indirect payments, including those for medicines. The data covered 47,302 and 26,566 rural and urban households, respectively. Information was collected by using the structured survey schedule. It consists of detailed information regarding the household’s socioeconomic status, household’s expenditure including medical care, sources of treatment, any family member(s) suffering during the last 15 days, hospitalization care during the last one year and nature of the health problem, average treatment cost at each level and household’s coping mechanism. All the information was collected on last the episode of illnesses (reported morbidity). Household health care expenditure is defined as the out of pocket expenditure on drugs and medicines, consultation fees, hospital bed charges, transport charges and daily living cost, including food and lodging for the escorts of the ailing household member. In addition, we have used primary data collected from three districts of West Bengal during January-April 20073. These three districts are Malda, North 24 Parganas and Bankura. The households are selected on the basis of a systematic, two-stage sampling procedure. We selected 748 urban and 2403 rural households by two stage cluster sampling method. At the first stage, from each of the selected district, 35 primary sampling unit (PSU) covering both rural and urban areas were selected through PPS (probability proportion to size) method. In the second stage, we have selected 30 households from each PSU through systematic random sampling procedure. We used a structured questionnaire for primary data collection. The questionnaire consists of detailed information regarding household’s socio-economic contour, details household’s expenditure including medical care, sources of treatment, any family member(s) suffering during last one month and finally nature of health problem (minor illness, chronic illness, birth delivery and hospitalization), sources of hospitalized treatment, sources of treatment before hospitalization, average treatment cost at each level, household’s coping mechanism and lastly how much they are satisfied. The survey was carried out for 3150 households covering 15,206 individuals. The survey collected health care expenditure data for various categories of treatment like hospitalized care, outpatient care, birth delivery and chronic illness. The reference period however was considered differently for each of the case, i.e., recall period of a year was set both for hospitalization care and childbirth, three months was set for outpatient care and a period of one-month was considered for chronic illness. Chronic illness is defined as a condition that is long-lasting (eg, more than 3 weeks and in many cases lifelong), which needs to be managed on a longterm basis. All the information was collected on last episode of illnesses (reported morbidity). Household health care expenditure is defined as the out-of-pocket expenditures on drug and medicines, consultation fees, hospital bed charges, transport charges to the treatment site and daily leaving cost, including food and lodging for the escorts of the ailing household member. 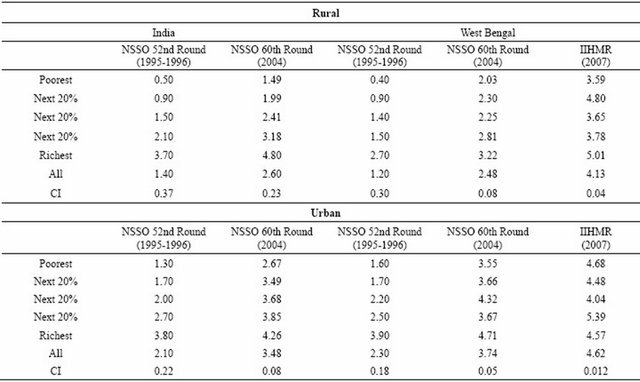 From each of the selected districts, 50 primary sampling units (PSU), covering either a village (in rural areas) or a urban ward (in urban areas) was selected by the probability proportions to size (PPS) sampling approach. Total numbers of sample in each district comprise 1050 households and 30 households are selected from each PSU. A 10 percent over-sampling (i.e., additional 2 households in each PSU) considered to take care of nonresponses. The Primary data was collected from the household through structure questionnaire. It consists of detailed information regarding household’s socio-economic contour, average annual expenditure on health care, sources of treatment, type of health care facilities available in this village or near-by villages, any family member(s) suffering during last one month and finally nature of health problem (minor illness, chronic illness, birth delivery and hospitalization), where they sought treatment, where they usually sought treatment before hospitalization, average treatment cost at each level. CSpro software package was used for data entry. The data set was recoded and transferred into the STATA data file. The analysis was done by STATA version 10. Step 1. First, the population were ranked according to their monthly per capita consumption expenditure (MPCE); second, the ranked population were grouped in five ascending quintiles (population in quintile 1 is the poorest and the same in quintile 5 is the richest); and third, number of hospitalized cases for each quintile was computed by multiplying number of hospitalized persons in each quintile in a year with how many times they were hospitalized. Step 2. First, the cumulative percentage of sample population (from quintile 1 through 5) was calculated, which is denoted as Pt (t = 1,∙∙∙, 5). Second, the cumulative percentage of estimated cases (from t quintile 1 through 5) was calculated that is denoted as Lt (t = 1,∙∙∙, 5). where P is the cumulative percentage of sample population and L is the cumulative percentage of the health variable ( say hospitalization cases) and suffix 1, 2, 3 and so on are the respective quintiles. To estimate the inequity in health care payments and to assess whether they are progressive or regressive, we have followed the method of Kakwani progressivity index . 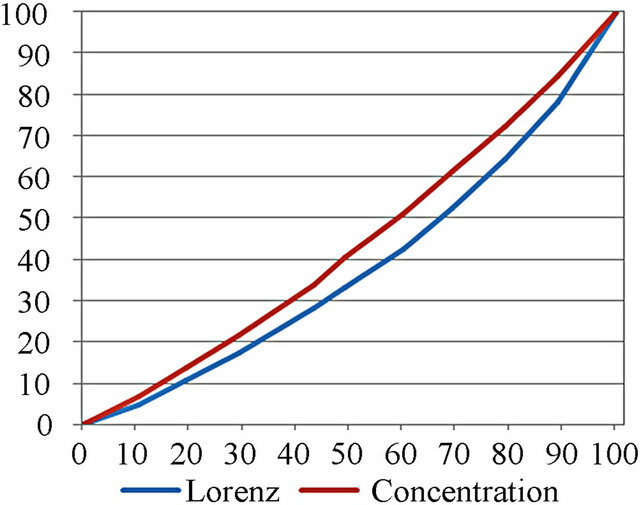 The progressivity can be assessed graphically through comparison of the concentration curve of health payments with the Lorenz curve of the ability to pay (ATP) (Same as capacity to pay for health care) variable. Both curves are plotted against the cumulative proportion of the sample households ranked by ATP on the x-axis and the corresponding value of cumulative proportion of health payments on Y-axis. Under proportionality, the curves will coincide with each other. 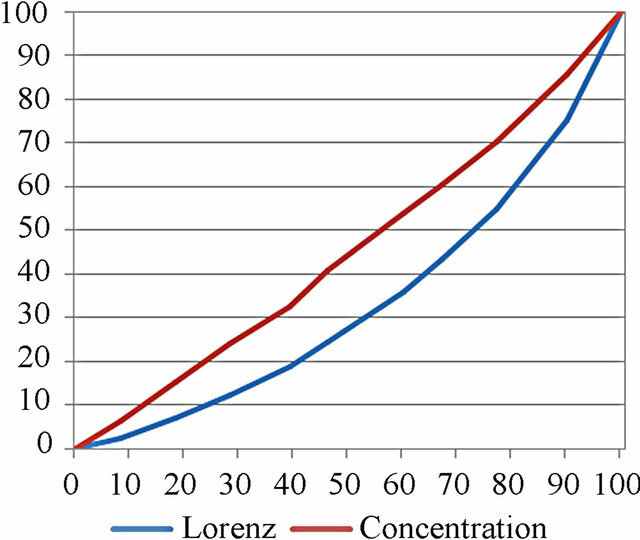 Under progressivity, health care payment concentration curve lies outside Lorenz curve of ATP and vice versa for regressively. Graphs are useful for detecting departures from proportionality and identifying their location in the distribution of payments. But visual inspection of progressivity across sources of finance, time or countries becomes difficult when there are a number of comparisons to be made. In such cases, summary indices of progressivity are useful. Of these, the most widely used is the Kakwani index . The Kakwani index is defined as twice the area between a payments’ concentration curve and the Lorenz curve and is calculated as, Πk = C − G, where C is the health payments’ concentration index and G is the Gini coefficient of the ATP variable. The value of Πk ranges from –2 to 1. A negative number indicates regressivity. A positive number indicates progressivity. 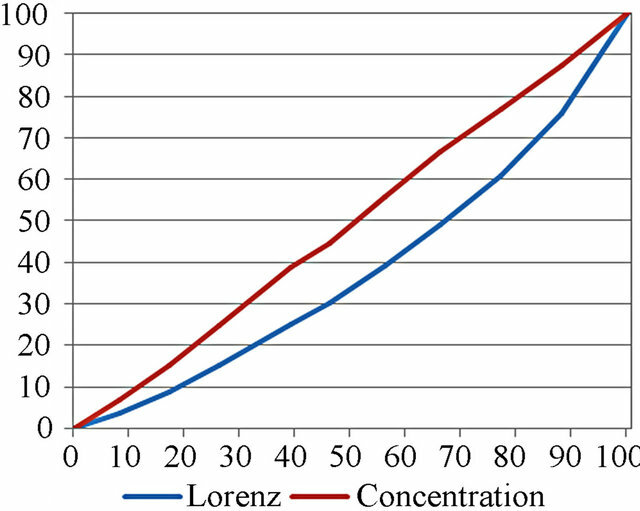 In the case of proportionality, the concentration lies on top of the Lorenz curve and the index is zero. Table 1. Inequality in hospitalization rate in West Bengal and India. Source: Author’s Calculation, Household Survey Data, 2007. India average. The reasons for better situation in West Bengal are people have more trust towards the public facilities and consequently they largely depend on it. The problem of accessibility is more severe in case of out-patient care due unavailability or inaccessibility of the public facilities. In rural areas, public health care or the qualified private clinic is out of reach. Unqualified rural medical practitioners (RMP) are the only option to do so. Result also shows that a rural resident has to travel less than a Kilometer (0.68 KM) to visit a RMP; the distance becomes double (1.48 KM) if it is a public health center and about ten times more (6 KM) if it is a clinic of a private qualified doctor. Physical accessibility, however, explains the demand side only partially. A public facility, even if it is closely located to a village, may be bypassed due to non-availability of a regular doctor. All medicines prescribed by a PHC doctor may not be available within the facility. Consequently, the patients have to remain prepared to pay upfront for the medicines they would purchase from private pharmacies. Moreover, the prescribed medicines, which are purchased from pharmacies, may not always be of the cheapest brand. Public health care system is a crucial element of the social welfare particularly in the developing countries and it may be the only option to protect the poor. But a pertinent question is who utilized these facilities? 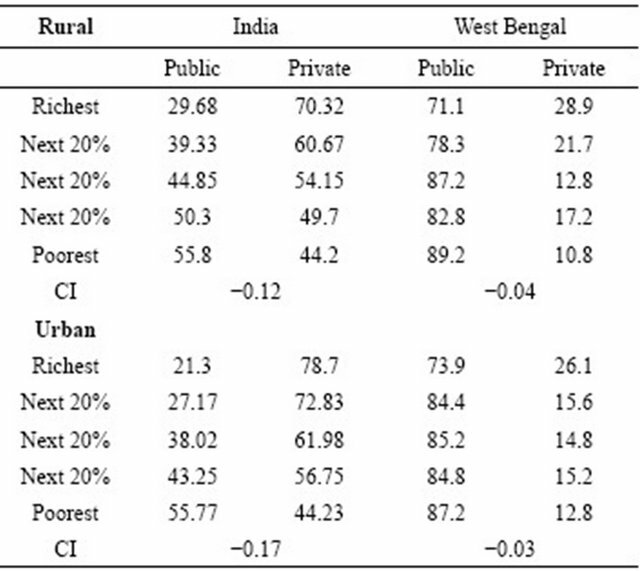 This study shows that in West Bengal people are largely depending on public health care facilities as compare to India. It has been seen that there are higher utilization of government health facilities by the poor people than the richer counter counterpart. The concentration index for the utilization of government facilities is negative (Table 2). This means that to some extent equity is maintaining for the utilization government health care facilities. However, of the utilization of government health care facilities in west Bengal is lower as compare to India. This means that in West Bengal the health care services is less equitable then all India average. Thus, the basic aim of the subsidized health care policy to protect the poor people has not been honored due to higher utilization of public health facilities by the high-income groups. This can be interpreted that the public subsidy has drop to the well-off groups through their higher utilization of government hospital. Thus it can be concluded that the present health care systems in west Bengal has been fails to protect the poor adequately. This section the study assessing the public expenditure along with the private out of pocket expenditure of health care and also study how much the system is pro-poor. Table 2. Public and private shares of hospitalization in India and West Bengal, by MPCE. Since last one decade, government spending on health as a percentage of GDP is quiet stagnant, while the country’s current economic (GDP growth rate) growth is spectacular. Consequently, health care personnel such as physician and nurses, bed per population is markedly lower as compared to many other developing countries in the one hand and people are facing high out of pocket expenditure on the other hand. To estimate the inequity in health care payment whether it is progressive or regressive the study followed the methods of health payments concentration curves and Kakwani progressivity index. To assess prograssivity or regrassivity of the health care payment, we plot the cumulative percentage of the sample households, ranked by their ability to pay, on the X-axis and on the Y-axis cumulative percentage of health care payment for concentration curve and ability to pay for Lorenz curve. In Figures 1(a) and (b) the curve is estimated to assess health care payment for hospitalization care. 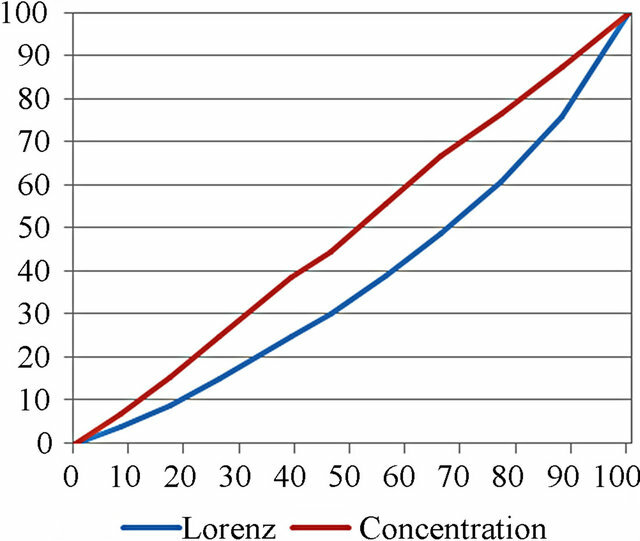 Here the concentration curves lie inside the Lorenz curve and Kakwani index is −0.14 for rural and −0.19 for urban. This result strongly interpreted that the health care payment is regressive. Figure 1. (a) OOPE in Hospitalization is Regressive (Rural), Kakwani Index = −0.14; (b) OOPE in Hospitalization is Regressive (Urban), Kakwani Index = −0.19. Source: Author’s Calculation, NSSO, 2005. Figure 2. (a) OOPE in Outpatient Care is Regressive (Rural), Kakwani Index = −0.24; (b) OOPE in Outpatient Care is Regressive (Urban), Kakwani Index = −0.23. Source: Author’s Calculation, NSSO, 2005.
treatment cost is covered by the out-of-pocket. As a mitigating strategy to cope up with the financial shocks, households sacrifice their daily food consumption, land, living house, children’s education, medical treatment of the other members and end up selling their assets etc. Thus this paper strongly concludes that the health care payment structure as followed by the government of India is not pro poor. The problem of regressive structure of health care payment is more severe particularly when households encounter major health problem. In case of hospitalization care the households are facing series hardship due to high catastrophic payment4 for medical care. Figure 3 shows that 20 percent of the higher, middle-income groups facing catastrophic payment due to unanticipated health shocked. In West Bengal, about 19 percent households facing catastrophic payment for hospitalized treatment. To mitigate such expenditure 34 percent poor households has lost all of their past savings, 30 percent households has borrowed with/without interest, and 2 percent of the households sale their assets. To protect the poor, the government of India has been started a dozen of programmes (such as Rural Health Mission, Janani Suraksha Yojana, Rogi Kalyan Samiti, Referral Transport facility etc.) for the enhancement of health and health care services. However the question is, how much this programmes have been shore-up to the poor to protect them from catastrophic health care payment. This study addresses the various support mechanisms to protect the poor for such impoverishment impact due to calamitous payment. There is very few direct support mechanism to overcome this unanticipated health care payment. Recently some private medi-claimed policies (such as health insurance) ran to compensate this payment. But these policies largely concentrated to the urban richer section of the society. The existing government support mechanism as shown in Table 3. It is apparent that except ration card (some sort of subsidy), coverage of other support mechanism is not reportable. Coverage of social health insurance in urban areas is only 9.3 percent where as in rural areas it is only 1.4 percent. This evidence indicates that the spectacular economic growth had failed to provide proper security when people faced any kind of health problem. Figure 3. Households facing catastrophic health care payment. Source: Author’s Calculation, Household Survey Data, 2007. Table 3. Social Securities of the Households. Source: Author’s Calculation Household Survey Data, 2007. The paper indicates a very dismal situation. Access to public health care that is a basic non-pecuniary individual attribute is severely impaired in this inclusive growth era. The study demonstrated that the inclusive growth not only fails to protect the poorest of the poor but also creates indigence and inequality. The out-of-pocket expenditure and the gaps between health care needs and the utilization of public health care facilities indicated that the public subsidy do not necessary ensure the vertical equity. It leads to disproportionate economic burden to the poorer section of the society. As a mitigating strategy to cope up with the financial shocks, distorted healthseeking behavior, households sacrifice their children’s education, medical treatment of the other members and end up selling their assets; consequently about one fifth of the households falls below the poverty line on account of catastrophic payments. The study argues that there are essential needs to strengthen the oversight role at the district level for implementing pro-poor policies and empower consumers (through civil societies) to reduce asymmetric information in the drugs market. Social health insurance as a part of overall social protection where non-salary subsidies are diverted to insurance fund may be the option to do this. The author expresses his appreciation for the data support provided by the Future Health Systems research programme consortium supported by the UK Department for International Development (DFID). Author also thankful to Prof. Barun Kanjilal for his valuable comments. Sen, A. and Dreze, J. (2011) Putting growth in its place. Outlook, 14 November 2011. Gumber, A. (2002) Health insurance for informal sector: Problems and prospects. Indian Council for Research on International Economic Relations. WHO (2003) Tobacco and health in the developing world. A Background Paper for the High Level Round Table on Tobacco Control and Development Policy. Ahuja R. (2004) Health insurance for the poor in India. WP-123, Indian Council for Research on International Economic Relations, 2004. Mahal, A., Yazbeck, A., Peters, D.H. and Ramana, G.N.V. (2001) The poor and health service use in India. Health, Nutrition and Population (HNP), Discussion Paper. 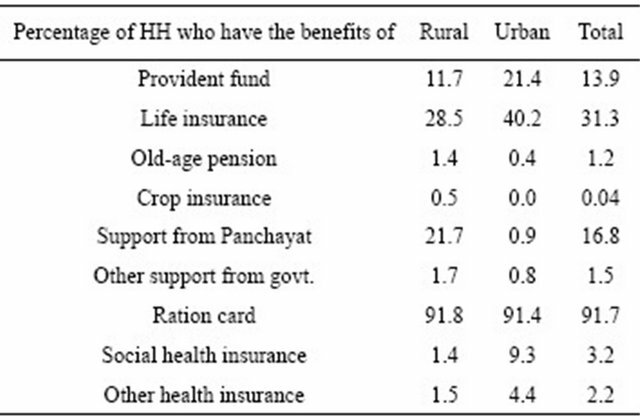 Ahuja, R. (2006) Health insurance for the poor in India. Policy Brief 12, Indian Council for Research on International Economic Relations. O’Donnell, O., Doorslear, E.V., Eliya, R.P., Somanathan A., Garg C., Hanvoravongchai P., et al. (2005) Explaining the incidence of catastrophic expenditures on health care: Comparative evidence from Asia. Working Paper No. 5, EQUITAP Project. Sen, A.K. (2006) The possibility of social choice. In: Agarwal, B., Humphries, J. and Robeyns, I., Eds., Capabilities, Freedom and Equality: Amartya Sen’s Work from a Gender Perspective. Oxford University Press, New Delhi, 369-419. Sen, A.K. (1985) Commodities and capabilities. Oxford University Press, New Delhi. Sen, A.K. (1993) Positional objectivity. Philosophy and Public Affairs, 22, 126-145. Lall, R.B. and Seal, S.C. (1949) General Rural Health Survey: Singur Health Centre 1944. All India Institute of Hygiene and Public Health, Kolkata. Soldo, B.J. and Hill, M. (1995) Family structure and transfer measures in the health and retirement study: Background and overview. Journal of Human Resources, Supplement, 30, S108-S137. Wallace R.B. and Herzog A.R. (1995) Overview of the health measures in health and retirement study. Journal of Human Resources, Supplement, 30, S84-S107. Idler, E.L. and Kasl, S. (1995) Self-ratings of health: Do they also predict change in functional ability? Journal of Gerontology, 50B, S344-S353. Schechter, S., Beatty, P. and Willis, G.B. (1998) Asking survey respondents about health status: Judgment and response issues. In: Schwarz., N., Park, D., Knauper, B. and Sudman, S., Eds., Cognition, Aging, and Self-Reports, Taylor & Francis, Ann Arbor, 229-247. Lambert, P. (1993) The distribution and redistribution of income: A mathematical analysis. Manchester University Press, Manchester. National Sample Survey Organization [NSSO] (2004) Morbidity, health care and the condition of the aged. Report on NSS 60th Round, New Delhi. 1Vertical equity requires that those with a greater ability to pay should pay more than those with a more limited ability to pay. 2Horizontal equity implies that those with similar abilities or income levels should pay the same amount for health care. 3The survey was conducted by Indian Institute of Health Management Research (IIHMR), India under a research programme consortium entitle—“Future Health System: Innovation for Equity” led by John Hopkins University, USA and other six global institute. Financial support for this research was provided by the Department for International Development (DFID), UK. Author was the research coordinator of this survey. 4Murray et al., defined catastrophic spending as household that actually spend more than 50% of their effective income after paying for subsistence needs.